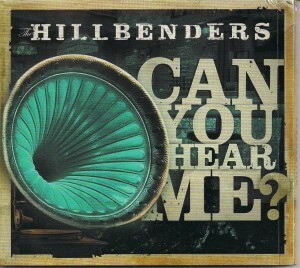 THE HILLBENDERS – CAN YOU HEAR ME? One of the definitions of “Symbiosis” is: “A close, prolonged association between two or more different species that is mutually beneficial to each member.” Yep….. that sounds like THE HILLBENDERS to me! “SYMBIOTIC!” Chad “Gravy Boat” Graves’ screamin’ dobro benefits from Mark Cassidy’s high wattage, parallel banjo licks, while Mark’s banjo benefits from Nolan Lawrence’s hot and tasty mandolin chops. Nolan’s mandolin benefits from Jim Rea’s enthusiastic guitar, just like Jim’s guitar benefits from his cousin, Gary Rea’s thunder storm driven upright bass, and Gary’s bass, in turn, churns right back around under the current of Chad’s dobro. Around and around they go, five different “Species” of instruments bouncing in and out of each other‘s space for their mutual benefit! Simply put, this band is so tight they probably all breathe in unison! There’s a very amazing thing that happens when a band becomes this close….. unless the listener is really paying attention, it can be hard to tell exactly which instrument is playing when! The pickup notes from the banjo over riding the end of a dobro line can be so fast and precise that you can’t tell when one ends and the other begins. Even the tone of each instrument becomes similar….. the individual sounds of the dobro and the banjo together then almost make a third unique sound all it’s own! And when the guitar and bass are so rhythmically solid under the solos and the mandolin is playing right ON that off beat, that all powerful FEEL, that has to be earned, with years of practice and live performances, suddenly takes on a life of it’s own and you have….. MAGIC!